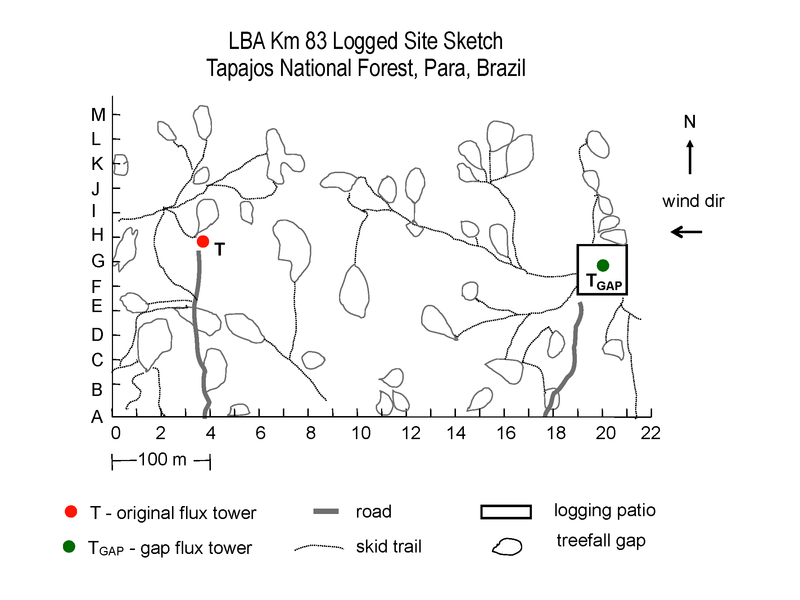 This data set contains the results of a survey of logging damage in a 18-ha plot (300 m N-S, 600 m E-W) east (upwind) of the eddy flux tower at km 83, Tapajos National Forest, Para, Brazil. Data collected include type of damage, snap height, and log dimensions, as well as calculated biomass of stems and canopy either damaged or removed in logging. There are two comma-delimited data files with this data set. Figure 1. Diagram of logging concessions area. From Figueira et al. 2008. The investigators were Goulden, Dr. Michael L.; Menton, Mary Catherine; Miller, Dr. Scott D.; Rocha, Prof. Humberto Ribeiro da; Freitas, Helber Custodio de; Figuera, Michela; Sousa, Cleilim Albert Dias de; Elliot, Rob and Read, Edward L. You may contact Miller, Dr. Scott D. (smiller@albany.edu ). This data set contains the results of a survey of logging damage in a 18-ha plot (300 m N-S, 600 m E-W) east (upwind) of the eddy flux tower at km 83, Tapajos National Forest, Para, Brazil. Data collected include type of damage, snap height and log dimensions as well as calculated biomass of stems and canopy either damaged or removed in logging. Common_name, Species, and Family for trees with LBA tag numbers installed in 2000 maybe obtained from the related data set, LBA-ECO CD-04 Biomass Survey, km 83 Tower Site, Tapajos National Forest, Brazil. 1 Gap_no ROW-NUM Location within the 18-ha grid where stump was located. These data allow a quantitative evaluation of the amount of biomass affected by reduced impact logging in a mature lowland tropical forest. The data have been checked and no further changes are anticipated. For calculation purposes missing DBH and snap or log lengths were replaced with mean values for each as noted below. For the CD04_KM83_Damaged_Tree_Statistics.csv file, trees with no recorded DBH were given a value of 18.17 cm which represents mean DBH, and for trees with no recorded snap height, a value of 3.12 m was used, which represents the mean for the data set. Trees for which Snap_ht (estimated in the field) was greater than Bole_ht (calculated from allometric equations), Bole_snap_fraction was set to 1. For the CD04_KM83_Logged_Tree_Statistics.csv file, trees with no tag or missing DBH were given the mean DBH value of 82.5 cm, and trees with no recorded log length were given mean log length value of 19.87 m for calculation purposes. For trees where the Log_length was greater than Bole_ht, Bole_removed was set to 1 and Bole_mass_removed was calculated accordingly. In March 2000, a 18-hectare plot (30 0m N-S by 60 0m E-W) directly east of the eddy flux tower at km 83, Tapajos National Forest, Para, Brazil, was surveyed. A grid of transects 25 meters apart was established and for all trees with a diameter at breast height (DBH) > 35 centimeters, diameter, commercial and total height, location within the plot, species common name, and condition (live, dead, damaged etc.) were recorded (Menton et al., 2011). Figure 2. Diagram of the Km 83 logged survey sites. Gap_no in the data files references locations on this map. Locations are coded as ROW-NUM, for example, A-11 and B-1. Between September and December 2001, the area was subjected to a reduced impact logging which removed 2-3 trees per hectare. As part of the reduced impact management, individual trees targeted were identified, vines cut to avoid damage to adjacent trees, and skid trails and logging patios planned out well in advance. After the logging operations were complete, the plot was resurveyed, and for every stem with significant damage from the logging operations and every stem cut, standing stem (snap) height, DBH, and species were recorded. For the trees cut, the dimensions of the logs removed were also recorded, and for non-target trees that were damaged, the type of damage was also recorded. From allometric equations (Chambers et al., 2001) total tree biomass, crown biomass, bole biomass, and bole height were estimated. From these values, the mass removed from the forest as logs, as well as the biomass left on site as slash and associated damage, was estimated on the stem level.